• If the current government shut down lasts more than 2 weeks, B61 activities will be curtailed, causing additional delays and therefore increasing costs. • Regardless of the present difference in House and Senate appropriations, the B61 LEP faces a $60 million cut in FY 2014 from sequestration and management efficiencies that cut 5% from the needed budget request. • Under the Continuing Resolution, since nuclear weapons activities did not get an anomaly, the B61 program cannot spend beyond FY 13 levels because of the Senate Energy and Water Appropriations bill. • At this point an omnibus appropriations bill is unlikely. But if House and Senate Appropriations were to go to conference (which is also unlikely) then there will be a battle over the different levels of funding for the B61 LEP. • As a subset to the point above, there is some talk about making the B61-12 the warhead for the new cruise missile, but that is very preliminary and wishful thinking. The B61 is not well suited for the environmental conditions and loads of a cruise missile and there needs to be sufficient diversity in the stockpile — you can’t make everything a B61. The bottom line is that given opposition from both Senate Energy and Water and Defense Appropriations, which zeroed out the tail kit for the B61, the National Nuclear Security Administration and the Department of Defense may be finally realizing that they need to find alternatives to the full B61 Life Extension Program. The Oct 2013 Department of Energy Inspector General (DOE IG) audit report “The Resumption of Criticality Experiments Facility Operations at the Nevada National Security Site” informs us that a move from Technical Area 18 (TA-18) at Los Alamos to the Nevada National Security Site, like many other DOE projects, is taking longer than planned. The report didn’t mention it but it, but the move is, no doubt, costing us more, too. The move centers on relocating four criticality assemblies. Criticality experiments use “assemblies” of enriched uranium and/or plutonium to create self-sustaining nuclear chain reactions. These assemblies differ from nuclear reactors in that the nuclear reaction is not sustained (assuming there are no accidents). Another significant difference is that the critical assemblies have no containment or shielding. [National Criticality Experiments Research Center] NCERC contains the largest collection of nuclear critical mass assembly machines in the western hemisphere. These assemblies can be broadly categorized as benchmark critical assemblies, general-purpose assemblies, and fast- burst assemblies that were designed to accommodate a broad range of experiments. Godiva is a bare metal uranium fast burst assembly designed to provide an intense burst of neutrons during an extremely short pulse. Flattop is a unique fast-spectrum assembly used for cross section testing and training. Planet and Comet are general purpose vertical assembly machines that are designed to accommodate experiments in which neutron multiplication is measured as a function of separation distance between experimental components. Fuel materials include uranium, plutonium, and neptunium. Clearly, safety and careful planning would be of the utmost importance with these operations, which include conducting nuclear criticality experiments along with hands-on, criticality safety, and emergency response training. In April 2000, then DOE Secretary Bill Richardson ordered that TA-18 be shut down and all the nuclear materials be completely removed by 2004. So instead of completing the move the 2004, DOE and Los Alamos Lab had only started the move by 2004. Nuclear Watch NM voiced our concerns many times, including when we learned that a Federal Safety Board concluded fatal doses were possible if there was an accident. As far as operational safety goes, neither the fact sheet nor the DOE IG Report mentioned that TA-18 was intentionally located at the bottom of Parajito Canyon so that the 200-foot canyon walls could provide some natural radiation shielding. This meant that TA-18, with its estimated three tons of highly enriched uranium and plutonium, sat in a flood plain. The results of the DOE IG audit states that many of the former capabilities of the were restored in Nevada. However, several problems resulted in delays in restoring the full array of experimental capabilities. NNSA was unable to authorize operations until May 2011, approximately 1 year after the planned date. The program experienced further delays in the start-up activities of each criticality machine, with completion of all planned startup activities for one machine delayed about 2 years. DOE has not been able to restore full capability to perform plutonium-based criticality experiments. The Report results state that delays occurred because contractors had not developed adequate procedures for correcting concerns identified during the process to authorize the start-ups. Also, procured safety equipment did not meet standards. Additionally, the Report claimed that DOE had not ensured effective management of the multiple contractors involved and had struggled to successfully integrate and resolve issues between the multiple contractors. Which is odd, because there were only four contractors mentioned in the report – Los Alamos, Lawrence Livermore National Laboratory, National Security Technology, LLC, Wackenhut Services International. Exactly what Wackenhut (which provides security, fire rescue and aviation services) did for the move was not stated. We do appreciate the focus on safety, but if these operations are so important, DOE must emphasize completing the job to avoid wasting any more taxpayers’ money. Once again the Department of Energy proves that its contractors cannot juggle safety, schedule, and cost without dropping as least two. And apparently DOE has trouble efficiently juggling contractors, which is too bad because contractors attempt to perform over 90% of DOE’s work. This, like most LANL statements, could use a little decoding. 2. For 2014, the Press release states the Plan will provide “$1 million for economic development such as financial and technical assistance to start and grow regional businesses. ” However, the contract states that the Lab receives a $1.8 million tax credit (per year) from the State of New Mexico for providing technical services assistance to small business. It is unclear to us what the Lab does with the other $.8 million. 4. The Press release continues that the Plan will provide “$1.1 million for educational programs and scholarships for New Mexico students and teachers as well as workforce development programs.” One of the scholarship programs that the Lab provides is the Out-of-State Tuition and Fee Waiver program. The contract explains that this program is for any LANS “full-time active employee and/or dependent who is accepted to any University of California undergraduate or graduate program. Based on the past 3 years of data, approximately 100 students will take advantage of this program annually. Out-of-state tuition and fee waiver represents a savings of $17,000 per student each year” or $1.7 million annually. 5. For meeting its community giving contract requirements, the then Lab receives an award fee on top of the regular payments. LANL’s FY 2012 Performance Evaluation Report does not give the public the exact breakout, but we know that Performance Based Initiative 11 (PBI 11: Excellence in Business and Institutional Management), which includes community giving, earned the Lab an additional $3,656,808 for 2012. Wired Magazine’s alarmist article NASA’s Plutonium Problem Could End Deep-Space Exploration argues that virgin production of plutonium-238 in nuclear reactors is needed, or U.S. space exploration is dead. Instead the nation’s future Pu-238 needs should be met through accelerated nuclear weapons dismantlements and recycling/scrap recovery efforts. Processing and encapsulation of Pu-238 currently takes place at the Los Alamos National Laboratory in northern New Mexico. [Having said that, all plutonium operations at the Lab have been shut down since the end of June because of nuclear criticality safety issues, which is a story in and of itself]. A Pu-238 scrap recovery line capable of recovering 2-8 kilograms per year was slated to start in 2005, but apparently has never become fully operational. In fact, LANL claimed in a 2008 site-wide environmental impact statement that it was capable of recycling/recovering up to 18 kilograms of Pu-238 per year, far more than needed to take care of the nation’s needs. LANL has a large existing inventory of Pu-238 scrap material. Moreover, the Pantex Plant was supposed to ship radioisotope thermoelectric generators (RTGs) from dismantled nuclear weapons to the Lab to harvest Pu-238. That hasn’t happened either, we conjecture because the LANL’s scrap recovery line hasn’t been properly working (or perhaps never really started in the Lab’s troubled Plutonium Facility-4). Indeed, the government estimated that approximately 3,200 RTGs would become available for recycling between 2009 and 2022 through nuclear weapons dismantlements. Significantly, increased dismantlements could also supply sufficient recycled tritium for existing nuclear weapons instead of current military production in civilian reactors, a big nonproliferation no-no. But unfortunately dismantlements at the Pantex Plant are substantially blocked by exorbitant “Life Extension Programs” that extend the service lives of existing nuclear weapons by three decades or more while giving them new military capabilities. Before the U.S. resumes virgin Pu-238 production, the government should make LANL straighten out its Pu-238 recovery operations. Safely that is, because Pu-238 is a very energetic gamma emitter and therefore very dangerous to handle. But the nation’s future Pu-238 needs should be met through accelerated nuclear weapons dismantlements (instead of Life Extension Programs) and recycling/scrap recovery efforts, not new virgin production in nuclear reactors. It’s big government on steroids. The National Nuclear Security Administration, a division of the U.S. Department of Energy, is tasked with securing and maintaining the nation’s nuclear arsenal. It oversees Los Alamos National Laboratory and Sandia National Laboratories in New Mexico. For years the agency’s MO has included expectations of nearly automatic budget increases, bloated projects that are never finished, duplicative red tape and a bureaucracy that resists efforts to rein it in. Critics say it has become a massive jobs program. Ten of its major projects are collectively over budget to the tune of $16 billion and behind schedule by 38 years, according to the U.S. Government Accountability Office. For instance, at LANL a new $213 million security system to protect sensitive nuclear bomb-making facilities doesn’t work. So, taxpayers are being asked to lay out an additional $41 million to fix it. The chairwoman of the Senate Homeland Security subcommittee that oversees finances and contracts largely blames the agency’s reliance on private contractors – more than 92,000. LANL and Sandia are operated by private contractors, LANL by a consortium led by Bechtel, and Sandia by Lockheed Martin. Former Lockheed Martin CEO Norman Augustine told Congress this spring that accountability and internal structure problems pose a national security risk. And there’s no doubt NNSA’s work is critical to U.S. national security, but taxpayers also are tired of watching their money being thrown at an insatiable beast that too often fails to deliver results. As long as the NNSA remains impervious to calls for improving its culture and tightening up its accountability, the inefficiencies and waste will keep coming. It’s way past time for that talk. The panel should come up with a well-thought-out plan to either overhaul NNSA from top to bottom or outright kill it and let the DOE take on its oversight duties. Kudos for the editorial “Time past for coddling bloated nuclear agency.” The money the National Nuclear Security Administration (NNSA) has wasted on out-of-control nuclear weapons projects is appalling. Some examples are the Chemistry and Metallurgy Research Replacement Project at Los Alamos (estimated costs exploded from $660 million to $5.8 billion), the failed National Ignition Facility at the Livermore Lab in California ($1 billion to $5 billion), the MOX Fuel Fabrication Facility in South Carolina ($1 billion to $7 billion), and now the Uranium Processing Facility at the Y-12 Plant in Tennessee ($1 billion to $10 billion). Despite all this chronic mismanagement NNSA’s proposed budget was increased 17% above FY 2013 sequester levels. That’s right, the guilty were rewarded, while schools, firefighting, environmental protection, etc. were cut. But while NNSA is truly dysfunctional, its contractors deserve more scrutiny as well. After all, the agency is simply out manned, with some 2,600 (and declining) employees trying to oversee more than 50,000 contractor employees nation-wide. Moreover, these contractors have inherent conflicts-of-interest. For instance, the lab directors wear two hats, first as those responsible for annual certification of the safety, security and reliability of the nuclear weapons stockpile, which gives them enormous leverage. Their second hat is as presidents of the executive boards of the for-profit corporations running the labs. How can we be sure they are always acting in the best interests of the country while they are pushing a never-ending cycle of extremely costly “Life Extension Programs” for existing nuclear weapons? Ironically, these programs may actually erode confidence in stockpile reliability by intentionally introducing major changes that can’t be full-scale tested. • The NNSA is a failed experiment and should be abolished. Its nuclear weapons programs should revert back to “Defense Programs” within the Department of Energy, as it was pre-2000. • As guarantors of the nuclear weapons stockpile, the lab directors should be just lab directors, their jobs institutionally insulated from the for-profit motivations of the private corporations running the labs. • Duplicative bureaucratic red tape should be eliminated, but federal oversight should be increased, not decreased (witness a protesting 82-year-old nun infiltrating an extremely sensitive area at Y-12 despite contractor security assurances). Concrete benchmarks need to be put back into now toothless annual Performance Evaluation Plans so that contractors are held truly accountable. NNSA’s past practice of granting waivers for poor performance while handing out contract extensions (as was done for the Los Alamos and Livermore Labs) must end. • DOE should be required to seek concurrence from the congressionally chartered Defense Nuclear Facilities Safety Board early in the design of nuclear facilities. Past NNSA delays in meeting safety concerns have been a prime driver of exploding project costs. • Congress should establish a stringent change control process for nuclear weapons, including a requirement for outside review of all proposed major changes. Because the labs lack conservatism in maintaining the pedigree of tested, reliable designs, independent expert review could save 100’s of billion of dollars over the next few decades and help maintain confidence in stockpile reliability. As a past example, a group of eminent independent scientists called the JASONs found that the cores of nuclear weapons, the plutonium pits, have reliable life times of around a century, in contrast to NNSA’s previous claims of 45 years. This helped to convince Congress to delete funding for NNSA’s proposed, enormously expensive new-design nuclear weapons and related expanded plutonium pit production. • Finally, the congressionally appointed panel deliberating on NNSA’s future should itself be above reproach. One member, former Congresswoman Heather Wilson, pocketed $450,000 in no-bid “consulting” contracts with the Los Alamos and Sandia Labs, in between her terms representing New Mexico’s First District and her Senate campaign that largely championed the labs. She should resign from the panel so that its future recommendations are not tainted by her clear conflict-of-interest. A Government Accountability Office (GAO) report reveals how the future of expanded nuclear weapon component production at Los Alamos is unknown. The public has had enough of half-baked billion-dollar plans for nuclear facilities that do nothing but line contractors’ pockets. Congress must put away the check book and realize that the Lab’s plutonium future is unknown because it is unneeded. Los Alamos National Laboratory (LANL) houses most of the nation’s capabilities for plutonium research and development in support of the nuclear weapons mission. In addition, LANL’s scientists and technicians also perform research on plutonium to support other missions, such as conducting research on recycling plutonium for use as fuel in commercial nuclear reactors (MOX). The National Nuclear Security Administration (NNSA), a separately organized agency within the Department of Energy (DOE), is responsible for the management of the nation’s nuclear weapons. Plutonium pits are the fissile cores of modern nuclear weapons (fissile means capable of sustaining a nuclear reaction). When a nuclear weapon is detonated the pit is explosively compressed into a critical mass that rapidly begins atomic fission. In modern two-stage weapons the plutonium pit acts as the primary (or “trigger”) that initiates fusion in the thermonuclear secondary. Each pit is an atomic bomb in its own right, similar to the Trinity and Nagasaki bombs, both of which were plutonium bombs. In thermonuclear or hydrogen bombs the plutonium pit serves as the trigger that detonates the far more powerful fusion explosion characteristic of hydrogen bombs. Because of public participation, lack of need, and budget concerns, construction of the Lab’s $6 billion Chemistry and Metallurgy Research Replacement (CMRR) nuclear facility was deferred for at least five years starting in 2012. The CMRR would have enabled a production capacity of 50-80 pits per year. Theoretically, the Lab is currently capable of producing 10-20 pits per year, maybe. But it produced zero this year. It is now unclear when or if the CMRR nuclear facility will be built, which the Lab claims may lead to insufficient capabilities to meet LANL’s plutonium research requirements. But no one really can say what these requirements are. Officials have announced that they are seeking alternatives to the CMRR that would provide the capabilities planned for the CMRR nuclear facility using existing facilities. This would be replacing deferred unneeded capabilities with unneeded capabilities. Instead of trying to replace the lacking capabilities of the CMRR, NNSA should first describe the actual pit needs, which are none. But the 30 number is just a guess “for planning purposes”. “Studying the possibility” is not a need. The real action will begin soon. Note the press release’s phrase “With the incorporation of a new Air Force tail kit assembly…” In its last budget request NNSA marks the following milestone “In FY 2014, NNSA will integrate the nuclear bomb assembly components and the Air Force Tail Kit Assembly into functional Compatibility Test Units (CTUs) for integration testing with Air Force nuclear certified aircraft.” NNSA FY 2014 Congressional Budget Request, page WA-32. This is a good example of how the NNSA’s ~$10 billion B61 Life Extension Program and the Air Force’s ~$3.2 billion Tail Kit Assembly program are co-joined. Together they will create the world’s first nuclear “smart” bomb for delivery by future super stealthy F-35s (with each bomb costing more than twice their weight in gold). This clearly creates new military capabilities for an existing nuclear weapon, contrary to official U.S. policy declared at the 2010 NonProliferation Treaty Review Conference and elsewhere. WASHINGTON, D.C. – As part of the ongoing effort to refurbish the aging B61 nuclear bomb without resorting to underground nuclear testing, two successful B61-12 radar drop tests were successfully completed at the Tonopah Test Range in Nevada on Aug. 14 and 15, 2013, by engineers from Sandia National Laboratories. Current B61s use decades-old vacuum tubes as part of their radar system. The new radar system, which had not been tested outside of a laboratory environment, was assembled in a gravity bomb configuration and successfully functioned as it was dropped from a helicopter. The Nuclear Weapons Council, a joint Department of Defense and Department of Energy/NNSA organization established by Congress, moved the B61 Life Extension Program (LEP) from the planning stages to development engineering in February 2012. The scope of this LEP includes refurbishment of both nuclear and non-nuclear components to address aging, ensure extended service life, and improve safety, reliability and security of the bomb. With the incorporation of a new Air Force tail kit assembly, the design will also enable consolidation and replacement of the existing B61-3, -4, -7, and -10 bombs by the B61-12 bomb. The LEP will reuse or remanufacture existing components to the extent possible. This radar drop test is one of several critical milestones for the B61-12 LEP this year. Radar testing will continue with integration of other B61-12 components, including the weapon and firing control units to demonstrate the arming, fuzing and firing subsystem. The B61-12 LEP is an essential element of the U.S. strategic nuclear deterrent and of the nation’s commitments to extended deterrence and it ensures the continued vitality of the air-delivered leg of the U.S. nuclear triad. A Los Alamos National Laboratory fact sheet touts the Lab as a plutonium “center of excellence”. However, the Laboratory Director paused operations in the Plutonium Facility on June 27, 2013. (The Plutonium Facility, called PF-4, is located at Technical Area 55 at Los Alamos National Laboratory (LANL). PF-4 is home for the Lab’s plutonium work, including nuclear weapons component production.) The pause was based on issues identified during safety reviews and findings from recent assessments. For one, the Defense Nuclear Facilities Safety Board (Board) performed a review of the Criticality Safety Program at Los Alamos National Laboratory (LANL) in May 2013. (The Board is an independent organization within the executive branch chartered with the responsibility of providing recommendations and advice to the President and the Secretary of Energy regarding public health and safety issues at Department of Energy (DOE) defense nuclear facilities.) This review identified significant non-compliances with DOE requirements and industry standards in the Lab’s Criticality Safety Program (CSP). In addition, this review identified criticality safety concerns around operations at the Plutonium Facility. The Board noted that some of these deficiencies are long standing and indicated flaws in federal oversight and contractor assurance. Much plutonium work, especially work with a high potential for criticality, will be stopped through the rest of 2013. Nuclear criticality safety is defined as “protection against the consequences of an inadvertent nuclear chain reaction, preferably by prevention of the reaction.” The most potentially dangerous aspect of a criticality accident is the release of nuclear radiation if it maintains a self-sustaining nuclear chain reaction. To date, the only thing self-sustaining is the Lab’s inability to address its criticality issues and yet still convince Congress to keep funding plutonium work there. To prevent bad things from happening, DOE’s regulations and directives require contractors to evaluate potential accident conditions and put in place appropriate controls and safety measures. History shows that the Los Alamos Laboratory just cannot do this, even though much of the work is performed on plutonium pits, the primaries of nuclear weapons. Even though actual need for this work has not been proven, the Lab has entrenched itself as the only place in the country where plutonium pits can be made, developed, and tested. 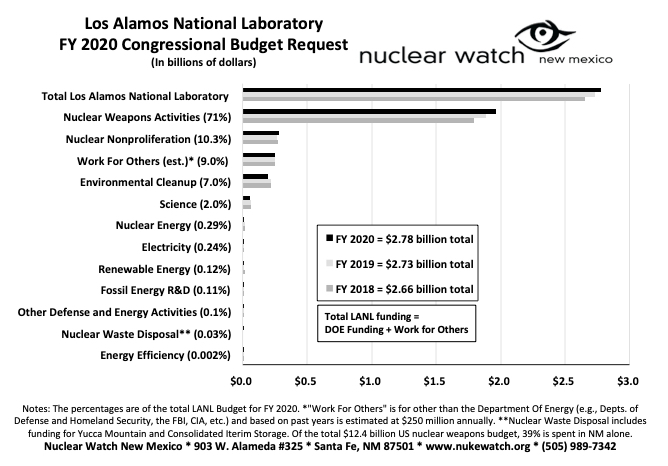 For fiscal year 2014, the budget request for nuclear ‘weapons activities’ at LANL was $1.4 billion. The exact amount that is spent on plutonium operations in PF-4 is unknown to us, but the budget request for 2014 for Directed Stockpile Work, which is where major parts of the plutonium operations are located, was $460 million. This is a 23% increase over last year’s budget. The funding pours into the Lab regardless of whether the Lab is actually doing any work, which is frequently stopped. In 2005, an assessment determined that LANL’s expert-based Criticality Safety Program (CSP) was not compliant with applicable DOE requirements and industry standards. In 2006, LANS developed a Nuclear Criticality Safety Program Improvement Plan. In 2007, in response to concerns raised by the Board’s staff, LANL determined that the authorized loading of vault storage rooms in PF-4 could lead to a critical configuration. In 2008, the Government Accountability Office reported concerns about nuclear safety at LANL are long-standing. Problems included 19 occasions since 2003 where criticality safety requirements were violated, such as storing materials in quantities higher than safety limits allow, 17 of 19 of the site’s nuclear facilities operating without proper safety documentation, reported inadequacies in safety systems, radiological releases, and four enforcement actions for significant violations of nuclear safety rules. LANL management placed the facility in stand-by mode until roughly 125 safety evaluations could be re-evaluated. The Plutonium Facility was placed in standby mode because management declared the fire suppression system inoperable based on recent hydraulic calculations that concluded the system was not able to achieve the water coverage required. LANL had performed a system adequacy analysis in 2008. The hydraulic calculation completed for the system identified that 13 of approximately 100 hydraulic areas did not meet the requirement. A general evacuation alarm was caused by a Criticality Alarm System signal because of a loss of all facility ventilation and failure of the Facility Control System at the Plutonium Facility. The facility was in standby mode during this event due to previously identified issues with the fire suppression system and, therefore, limited personnel were in the facility. Operations in Plutonium Facility were suspended because potentially explosive ammonium nitrate was discovered in two filter ducts. It was revealed that greater than 1000 items, or about 20%, of the total vault holdings are items packaged in potentially vulnerable containers with taped slip-top lids rather than in robust safety-significant containers that include a HEPA-filtered vent. The presence of these slip-top containers requires respirator use whenever operators access the vault. In FY10, LANL made meaningful progress in addressing these legacy materials. In 2011, an event occurred at PF-4 in which fissile material handlers violated procedural requirements and criticality safety controls while moving and photographing plutonium rods. Beginning in 2012, LANS experienced an 18-month exodus of criticality safety professionals from its criticality safety group. LANS currently employs 2 full-time and 2 part-time qualified criticality safety analysts, in addition to 3 part-time subcontractors—far fewer than the 17 criticality safety analysts it has determined to be necessary to support operations, meet mission goals, and maintain the CSP. MAR Tracker that caused only a small subset of applicable facility containers (roughly 1700 out of 13000 containers) to be checked during the required annual MAR surveillance. The Plutonium Facility was placed in Standby Mode. LANL identified a number of fuel rods in TA-35 Building 27 that were not consistent with the criticality safety evaluation for the facility. Operations at this building had previously been suspended in late-May due to the discovery of three fuel rods that were not in the facility or institutional tracking systems. LANL identified that the Criticality Safety Evaluations (CSEs) for two rooms did not adequately address the potential for interaction effects between storage locations. Plutonium Facility management suspended operations in these two vault rooms. LANL began a focused training program (“boot camp”) to provide an intensive learning environment for new criticality safety staff. The program consisted of nine modules including: nuclear theory; criticality safety calculation methods; ANSI/ANS, DOE and LANL criticality safety standards and requirements; criticality safety evaluations; and criticality alarm and detection systems. This program along with on-the-job training and performance demonstrations was to provide a mechanism for achieving full qualification as a LANL criticality safety analyst. Conduct of the boot camp was part of the LANL corrective action plan for improving the nuclear criticality safety program. The laboratory completed criticality safety assessments at LANL nuclear facilities. The review teams identified 3, 4, and 6 findings for TA-55, CMR, and Area G, respectively. In all cases, the assessments concluded adequate implementation of the Criticality Safety Program with the exception of identified findings. Notably, one of the findings at Area G identified that supervisors and operations center personnel did not have an adequate understanding of criticality safety requirements. Area G management paused operations based on this finding and conducted appropriate training to resolve this issue. •	Most criticality safety controls are not incorporated into operating procedures. •	Operators typically do not utilize written procedures when performing work. •	Fissile material labels do not list parameters relevant to criticality safety (e.g., mass). •	Some fissile material operations lack Criticality Safety Evaluations (CSEs). •	Some CSEs do not analyze all credible abnormal conditions. The Laboratory Director paused programmatic activities at the Plutonium Facility. The pause was directed based on issues identified during procedural and criticality safety reviews and findings from recent assessments. Reviews at PF-4 have identified a number of procedural issues and the need for clarification and improvement of criticality safety controls. Plutonium Facility personnel identified several criticality safety issues associated with recent construction activity. Even though plutonium work was paused, the Laboratory Director and the Facility Operations Director (FOD) approved construction activities that had the potential to affect nuclear materials. Secretary of State John Kerry correctly condemned the Syrian regime’s apparent use of chemical weapons, but he’s wrong calling them “the world’s most heinous weapons.” Instead that awful distinction belongs to nuclear weapons, a class of weapons far above any other. If ever used again nuclear weapons would indiscriminately kill far more people, including women, children and non-combatants, than chemical weapons ever could, and poison the planet with radioactive fallout. Nevertheless our country is planning repeating cycles of “Life Extension Programs” costing $100 billion or more, giving existing nuclear weapons new military capabilities. This is directly contrary to what Kerry’s predecessor ex-Secretary Hillary Clinton declared as official U.S. policy at the 2010 NonProliferation Treaty Review Conference. The cost of the mismanaged Los Alamos and Sandia Labs’ Life Extension Program for the B61 nuclear bomb has more than doubled from $4 billion to $10 billion. A related $3.2 billion Pentagon program will produce a new tail fin guidance kit. Together these programs will create the world’s first nuclear “smart” bomb for delivery by future super stealthy aircraft, while each bomb will cost more than twice their weight in gold. The U.S. should review its own moral authority while preparing for military action in Syria. In particular our New Mexican congressional delegation must stop automatically supporting expanded nuclear weapons programs without deeply questioning their own consciences. Our politicians’ justifications to date have been to protect a few hundred jobs at the Labs, which don’t really trickle down to average New Mexicans anyway. As evidence of the lack of broad benefit to New Mexicans, according to the U.S. Census Bureau our state was 37th in per capita income in 1959. In 2010 we were 44th, despite the vaunted economic presence of the nuclear weapons industry in New Mexico, and in 2013 we were rated dead last for the well being of our children by the KIDS COUNT Data Center. Our politicians should be striving mightily that New Mexicans increasingly benefit from our vast renewable solar, wind, biomass and geothermal resources that would employ far more citizens, instead of pandering to nuclear weapons programs that produce a commodity that we can only hope will never be used. John Fleck of the Albuquerque Journal had an article today entitled “Sandia Labs manager gets 6 more months,” describing Lockheed Martin’s half year contract extension. John knows all three nuclear weapons labs well, and I won’t be telling him things that he doesn’t already know. But I’ll use his article as an excuse to stand on my soap box about Sandia Labs. To my taste, John’s article makes Sandia sound a little too benign with phrases like “the nuclear weapons research center” and “Sandia is one of the nation’s three nuclear weapons design and maintenance laboratories.” What is left unreported is that Sandia is a major production site that, for example, manufactured 850 neutron generators for nuclear weapons in 2010, and loads them with radioactive tritium. In addition to design responsibility for non-nuclear components, Sandia’s secondary mission has long been “weapons effects” research for making sure nuclear weapons continue to work in lethal radiation environments. This enables multi-strike nuclear warfighting rather than the simple deterrence sold as doctrine to the American public. Further, instead of mere “maintenance,” all three nuclear weapons labs (Sandia, Los Alamos and Lawrence Livermore) are lobbying for a never-ending cycle of so-called Life Extension Programs that will intentionally introduce profound changes to existing nuclear weapons. Major changes are the last thing we should do to a stockpile that has been extensively tested and proven to be even more reliable than previously thought, when we can no longer full-scale test. All of this will be of enormous expense to the American taxpayer, where for example the currently proposed Life Extension Program for the B61 bomb has exploded in costs from $4 billion to more than $10 billion, resulting in each bomb costing twice its weight in gold. Added to this is a related $3.2 billion Pentagon program giving the B61 a new tail fin guidance kit, transforming it into the world’s first nuclear “smart” bomb for delivery by planned super stealthy aircraft. In addition to prolonging their service lives for 30 years or more, these Life Extension Programs have and will create new military capabilities for existing nuclear weapons, despite denials at the highest levels of the U.S. government to the world at large (for example, at the United Nations’ 2010 NonProliferation Treaty Review Conference). The lab directors wear two hats, the first as directors who are required to annually certify to the president and Congress that the nuclear weapons stockpile is safe, secure and reliable. The second hat is that as presidents of the executive board of the for-profit corporations running the labs, which will directly benefit from never-ending Life Extension Programs that may actually undermine stockpile reliability. So far from mere “research” and “maintenance” we have a deep seated conflict-of-interest driven by profit that will stymie our global leadership toward getting rid of nuclear weapons while continuing to fleece the American taxpayer. Foremost in this is the Sandia National Laboratories, which amongst the three labs now has the largest nuclear weapons budget. 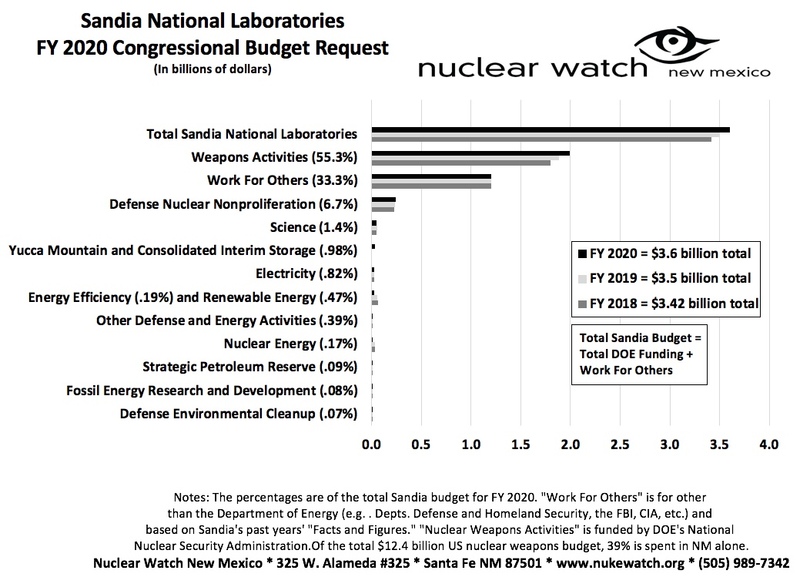 In the past, Sandia has been singled out as a model of lab mission diversification, with its total annual institutional budget falling below 50% nuclear weapons. That is no longer true given recent large increases to its nuclear weapons research and production programs, which now comprise ~55% of Sandia’s total budget. Predictive science is the application of verified and validated computational simulations to predict the behavior of complex systems where routine experiments are not feasible. The selected PSAAP II centers will focus on unclassified applications of interest to NNSA and its national laboratories — Lawrence Livermore National Laboratory, Los Alamos National Laboratory and Sandia National Laboratories. Funny, nuclear weapons are not mentioned. The good news, and few know this better than Utah, is that testing nuclear weapons no longer requires full-scale explosions. The bad news is that predictive science, to the NNSA, is the “science” of predicting whether nuclear warheads will work after they have been refurbished, modernized, and given new military characteristics. We know that the old versions work. Do the students know that they helping to prolong the nuclear menace by testing newly designed versions of the old weapons on their computers? It should be called nuclear weapons perpetuating science 101. Yesterday all three House members of the New Mexican congressional delegation voted against an amendment that would cut money added to a wasteful nuclear weapons program. In April the Obama Administration asked for $537 million in fiscal year 2014 for a “Life Extension Program” for the B61 Cold War nuclear bomb, 45% above the 2013 level. The House Appropriations Committee added $23.7 million to that bloated request, which the amendment would have cut. Overall, the B61 Life Extension Program has exploded in estimated costs to where each warhead will cost twice their weight in gold just to “refurbish” (which does not include original production and ongoing maintenance costs). At a time when we are slashing funds for disease research at the NIH [National Institute of Health], failing to fund our crumbling infrastructure, and underinvesting in our children¹s education, we are increasing funding to keep hundreds of nuclear bombs in operation that we will never use. The Cold War is over. …supported the full $551 million for the B61 Life Extension Program because it is a national security priority. “This funding is important for Los Alamos and Sandia labs’ effort to ensure the safety of the nuclear weapons stockpile, and cuts to that funding impact the ability to keep it secure,” Luján said. Rather just ensuring safety and security the program will radically improve the bomb, giving it new military capabilities by turning it into a precisely targeted smart bomb and mating it to future bombers for supersonic stealthy delivery. Currently the main mission of B61 bombs is as tactical nuclear weapons in NATO countries, a relic of the Cold War. Improved B61’s fly in the face of Obama’s newly declared goal of reducing the presence of battlefield nuclear weapons in Europe, even as he proposes to negotiate with the Russians for further arms reductions. Moreover, if security is really the issue, the sure solution that saves taxpayers money and encourages nonproliferation is to withdraw the nuclear bombs from forward deployment in Europe, where a few years ago protesting peace activists were able to infiltrate within a few hundred yards of them. Ironically, the B61 Life Extension Program may actually undermine our own national security by introducing major changes to existing bombs. Our stockpile has been extensively full-scale tested, and repeated studies have found our nuclear weapons to be even more reliable than previously believed. The Los Alamos and Sandia Labs propose to create a “frankenbomb” by mixing and matching four variants of the B61 bomb into a single new modification. Common sense dictates that the last thing we should do while seeking to maintain confidence in our reliable nuclear weapons stockpile is to introduce major changes that can’t be tested. Our New Mexican congressional delegation represents a state that was just ranked as the worst of all fifty for the well-being of its children, where more than 25% live in poverty. In stark contrast, Los Alamos County, dominated by the lab, is the second richest county in the entire USA. Nuclear weapons programs are a poor producer of jobs, where for example according to the government’s own documents a new $6 billion plutonium facility was not going to produce a single new permanent job at Los Alamos Lab. Contrary to the claimed economic benefits of the Los Alamos and Sandia Labs, New Mexico as a whole continues to fall from 37th in per capita personal income in 1959 to 44th in 2011. Nevertheless, the Labs have always had inordinate influence over New Mexican politicians. One extreme example is the recent starling revelation that in between unsuccessful Senate campaigns former Rep. Heather Wilson was paid more than $450,000 by the Los Alamos and Sandia Labs for “consulting” contracts that had no written work requirements. The nuclear weapons labs have voracious appetites for federal funding, with their directors simultaneously acting as the presidents of the executive board of the for-profit limited liability corporations that run the labs (those private LLCs pay 2/3’s of the directors’ annual compensation of around one million dollars). Business will boom with never-ending Life Extension Programs, and Sandia and Los Alamos are not satisfied with just one Life Extension Program for the B61. They already plan yet another one 20 years from now that initial figures indicate would be even more expensive. In fact, the labs plan a never-ending cycle of Life Extension Programs that intentionally seek to implement major design changes for all existing types of nuclear weapons in our stockpile, costing at least $60 billion (while the doubling of costs has so far been the rule). See House rejects effort to trim $23.7M in funding for B61, Michael Coleman, Albuquerque Journal, July 11, 2013.
io9.com has posted a bunch of nuclear test videos: view here. Air Force officials have started planning a ten billion dollar modernization of the B-2 stealth bomber fleet to include a new receiver using VLF waveform technology that allows the bomber to receive messages in the event of a high altitude electromagnetic pulse, and outfitting the aircraft for next-generation digital nuclear weapons such as the B-61 Mod 12 with the new tail kit, and Long Range Stand-Off weapons- (air-launched nuclear cruise missiles). See also Are New Nuclear Weapons Affordable? GAO: Accounting Problems at DoD so Significant that a Federal Audit Cannot be Done. WASHINGTON (January 17, 2013) – The U.S. Government Accountability Office (GAO) cannot render an opinion on the 2012 consolidated financial statements of the federal government because of widespread material internal control weaknesses, significant uncertainties, and other limitations.  Serious financial management problems at the Department of Defense (DOD) that made its financial statements unauditable.  The federal governments inability to adequately account for and reconcile intragovernmental activity and balances between federal agencies.  The federal governments ineffective process for preparing the consolidated financial statements.